A few months ago I posted a personal post and received really positive and supportive feedback. So today I thought I would do another one, but this time it’s happy. Over Easter, my partner Tom and I took a very quick trip to Northern Wales to get some last minute/last chance winter climbing in. Here is the trip report that he wrote up. Not much about food really. We did make a nice stir fry in the bunk house, however. 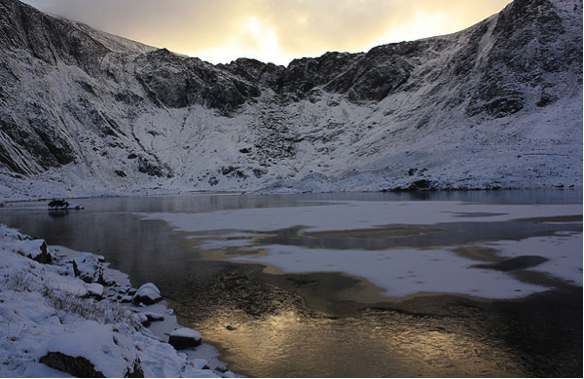 It was decided the night before we left that we’d make the most of the seemingly never-ending icy conditions in Britain this year, and planned to drive up to North Wales and Snowdonia National Park. It being the Easter weekend, we were somewhat surprised when the second bunkhouse we spoke to (Gwern Gof Uchaf, between Llyn Ogwen and Tryfan) had spaces for us over the weekend. It wasn’t till we arrived that we realised that the bunk house was half full of walkers and cyclists – the real winter climbers were all camping just outside the bunkhouse in a foot of snow, to harden up. So we arose from our luxurious bunks at 5:45 and made our way over to Cwm Idwal, for which I had printed a sketchy guide of the area downloaded the day before. It was at this point that the guidebook let us down (I had neglected to add any kind of topo!). Thankfully, there were already a few other early bird climbers who pointed out the major routes that were in good condition – which happened to be most of them. Being novices, we mistook South Gully (IV 5) for Idwal Stream (II 2), and headed to the base of the route expecting a warm up. Probably for the best then, there were already a couple gearing up for the Gully, so we ended up on Chicane Gully (III 3), its initial steep pitch having caught our eyes from the walk in. Chicane turned out to be a beauty of a route, with two pitches of good ice, a slightly bold snow gully, and a final romp up a short ice feature. We took a long time doing the route in swing leads, in part due to dropping and retrieving some gear off the first pitch, and in part due to my ‘winter nerves’ on the lead. Jess calmly led her first grade III ice pitch, no noise at all. Topping out in time for lunch, we enjoyed a bagel in the sunshine – who’d have though that it’d been in N. Wales all along? On the way back down the hill, we left our bags and ropes and had a wee explore of the renowned Devil’s Kitchen, which was an absolute wonderland of icicles and hoarfrost. The waterfall at the back was a well-formed 30ft ice pitch on the right, and frosted yet running waterfall to the left. On the way down we were captivated for an hour or so by a ballsy chap climbing The Curtain, which had formed as a slanting pillar you could wrap your arms around. We were unsure it would hold him, and so decided to stick around for the show, for better or worse! By this time we were both getting cold, so we decided to find a route we could tackle without ropes. Introductory Gully (II) turned out to be the best option. A popular scramble in the summer, this long icy slab offered a good 100m of climbing, before spitting us out on the top of the Idwal slabs. On the walk out, we spoke to a number of other climbers. It was definitely a crowded day, but the sunshine and good conditions seemed to leave everyone in a great mood. After some discussion with other climbers and the kind staff at Joe Browns (where we picked up a guidebook), we decided on heading back to the same area of Cwm Idwal, as there was still a number of routes for us to try, and a short walk in that we now knew. 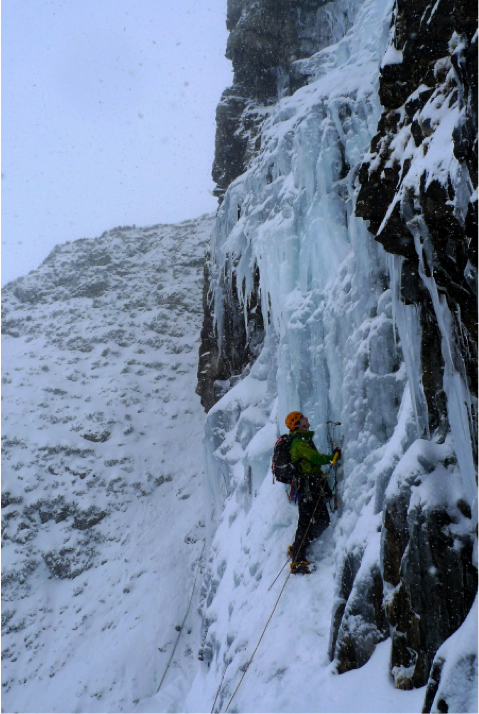 Up at 5:30, we were approaching the routes before 7 – but we had been beaten to South Gully again! We quickly dashed around the corner to the base of The Screen, before the six climbers heading up the hill also beat us to it. 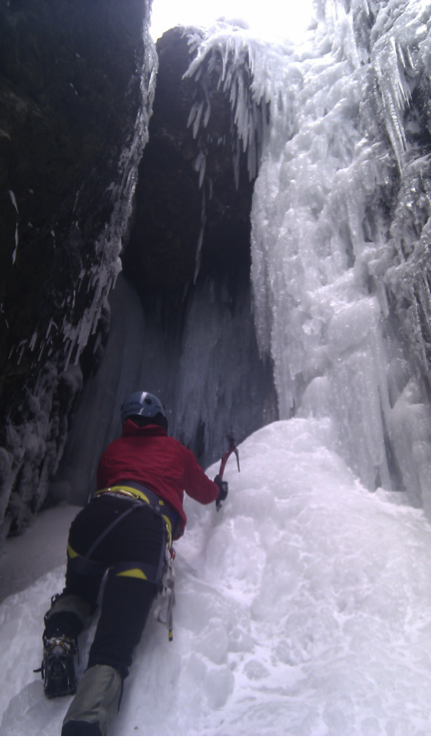 The Screen (IV 4) is a 4m-wide icefall route, which works up vertically for 15m through giant conglomerated icicles, before winding under a glassy chandelier to a mixed gully. This route was certainly my most testing winter route to date, I was pumped out and struggling to get a screw in, 2m above a sling wrapped around an icicle, and 5m above my last good gear. Eventually, the screw bit, my forearms stopped screaming at me, and I finished the route. My first grade IV, and one I’ll remember. Of course, Jess had no trouble at all seconding the steep pitch, and arrived at the belay with no qualms. We were stoked to have finished our first route by 9am today, and headed straight over to the Idwal Stream, for a brilliant long solo up to the saddle of the mountain, and some coffee. Our final route of the day was the South Gully, which had caught our eye the day before when we confused it with the stream. This four-pitch route was in great nick, and offered a lot of steep ice to test our mettle on. After a slow nervy start up the first pitch, Jess raced up the second to the base of the long third pitch seen in the photo. The climbers ahead of us were just topping out, making an aerobic looking couple of moves out from under an icy umbrella. The pitch turned out to be brilliant, and my length meant avoiding the wacky shapes that the previous group were using – I bit my axe sideways into a solid icy flake and trusted a low pull on it, bringing my right pick high over the umbrella; a high foot, and up to a good rest with obvious screw-holes and safety. Once again, Jess arrived at the belay with ease and a smile – she’ll be leading it next time then. That’s all for our trip. Short, but we tried to pack it in. Catch you next season Wales. great story – sending it to my grandson who’s learning to climb!